I have to thank Quilt Trends Magazine for doing such a great job styling my "Bouncing Wedges" quilt. The pattern for this quilt is in their summer issue which should be out soon. The quilt is made with Dan Stiles Mod Squad fabric and some of the solids from the Birch Mod Basics. Gotta love those solids! They make those prints shine. I made the quilt for Cynthia, of Birch Fabrics...actually I made two of them. Both quilts are still with her in her shop. I can't wait for them to come home again! Here are both color versions on display at Quilt Market in Kansas City. I've been experimenting with lots of wedge based designs lately and I'm pretty happy with this one. The quilting on both of these quilts is pretty intense and I think it adds so much to the design of the quilt. Those lines are 1/4" apart. Yikes! Took me forever, but it was worth it. I also love that Dan added this great bias stripe in his collecton. You get the bias binding look without having to cut bias binding. Gotta love that! If you'd like my extra copy of Quilt Trends with the pattern for Bouncing Wedges, leave a comment today and I'll draw a winner Wednesday. Comments are now closed...winner to be announced soon. Love the quilt! And wow- what a job an rhe quilting!!! Oh wow - I'm lost for words - those quilts are amazing. Going to Chicago in 4 weeks time, I'll have to look for a copy of the book. Beautifully done. They both look great hanging there. I love that I've not seen a pattern like this before and your quilting is really nice. I don't speak quilt so please don't enter me, but i have to say they are awesome - so fresh and so ...I don't even know. Stunning ! I love how you've combined stripes, prints, and solids so effectively -- I always have trouble with mixing fabric prints. These quilts are great examples! Those wedge quilts are stunning. I would love to win the magazine. Thanks for the chance. Beautiful as always!! Need to get the magazine. I'd love your extra copy! I saw the quilts in KC and swooned over them! They are beautiful quilts - I think you shared a snippet of one of these some time ago & it's great to see the whole picture. Thanks for the chance to win a copy of the magazine. I'd love a copy and a chance to make this quilt. Loved the binding too! I love those stripes and this quilt! I just love the quilting. Well worth the commitment! I saw you speak at the Chicago MQG in April. What you said that day continues to inspire me, more than two months later. I have taken my quilting in a whole new direction and am having so much more fun with it now. Thank you! Love this pattern - can't wait to see it in other color schemes! Would love that if you're happy to post it to me in Australia, otherwise my husband is coming to the States in a few months so maybe he could be the courier if I win! Those are great lookin' quilts! I really love the fabric too! Very fun pattern. Your quilts are gorgeous. I would love to win a copy of the mag. Thanks for the giveaway! Love both versions and, you are so right, the quilting is perfect!!!! 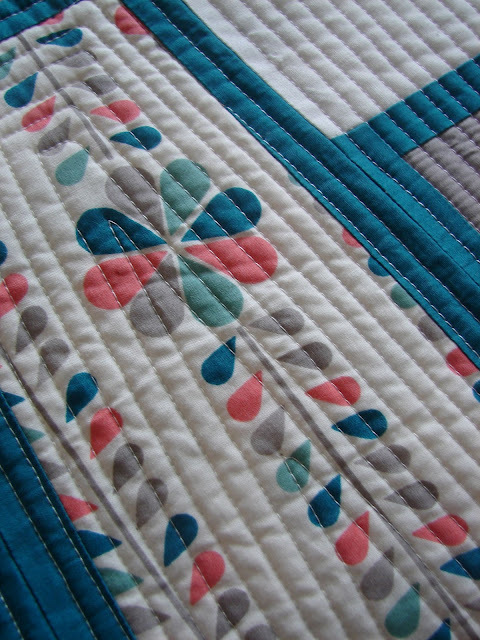 You're right - the tight quilting is TOTALLY worth it! Your quilt design is great. It's so different! 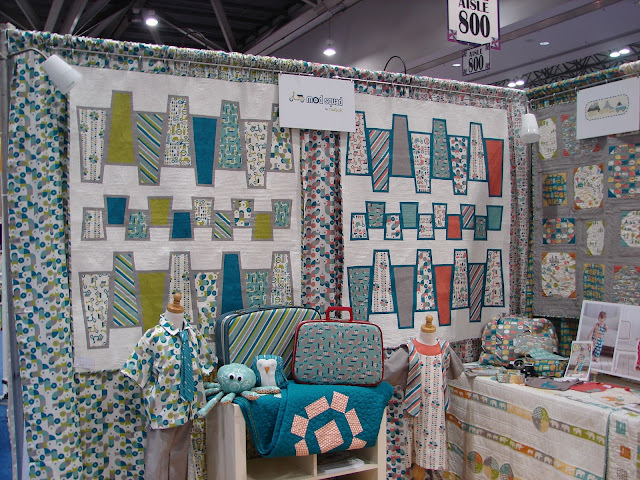 The solids really set the stage for the fabric line in these quilts. Great job. I'm also a sucker for a heavily quilted quilt. Terrific quilt. Would love a copy of the magazine. Fabulous quilt and I'm in awe of your patience with the quilting!! I LOVE these quilts, the design is beautiful! Great job on those quilts, they're absolutely beautiful! I luv bias bindings. All the quilting is super on the quilts. Yikes!! Amazing quilt. Those quilt lines are intense and just look fabulous. Another winner! I totally love your style of quilting and have just been given a copy of your new book, lucky me! Thank you for sharing with us. That is fabulous! Perfect for guy quilts. Something I've been looking for inspiration for. Thanks for a chance. Beautiful quilts. I have been admiring these in some of the market photos being shared online. Beautiful job. What a great design! LOVE the quilting, though I can imagine it was pretty tiresome by the end! Thanks for the giveaway! Beautiful quilts! Love the binding!!! Would love the book. Thanks. Thanks so much for pointing out the easy way to make a bias-look binding - wish more designers would gift us with those prints :-) Thanks for the chance to win your extra copy and the pattern - it is a showstopper! Great pattern! Simple, and modern, and a great way to showcase large scale prints. Wanting to make a quilt for my dad, and this would be a great pattern to use! Love the quilt design! I love the look of a bias stripe for binding, especially if I don't have to cut it. Thanks for the giveaway. I can't believe I haven't see this quilt before- both versions are lovely! I'd love to make this one day. I don't know this magazine at all so I'd love to win a copy! I love your quilts - I can see why Cynthia is still hanging on to them!!! I shouldn't enter because I've just won goodies from you, but I LOVE this quilt and would be excited for this magazine! P.S. I do cut bias, but I love the look of straight striped binding, so I'm always looking for diagonals that will look perpendicular in the end! Very fun quilts. Love seeing them side by side in different palettes. Great pattern and awesome fabric! Love these quilts. 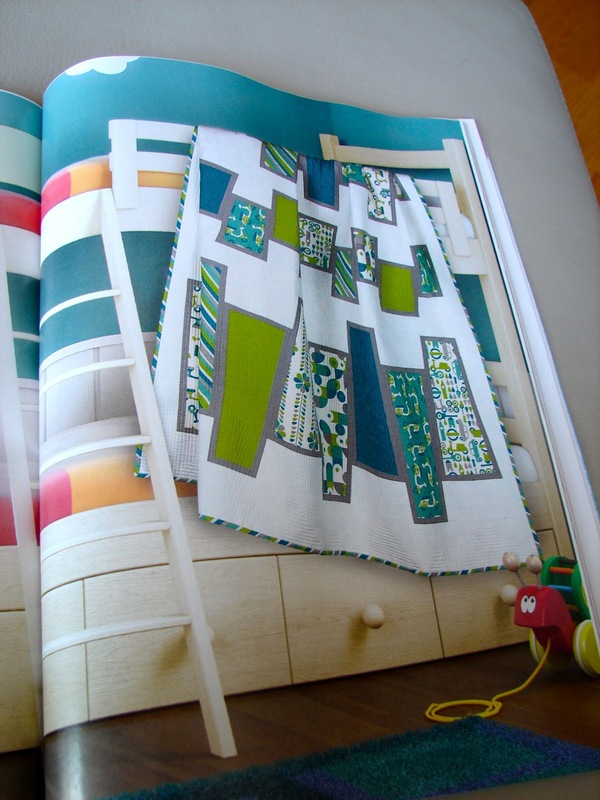 I'd love to have the extra copy of Quilt Trends so I can try one myself! I love your wedge quilts. I thought the baby quilt you made with the wedges was awesome and these are even more so. Love the blue and green -it's very soothing. Those Bouncing Wedges are wonderful and with the white background they really pop! Thanks for the giveaway ~ I love Quilt Trends Magazine! What a nice quilt and you are right, the quilting really sets it off. Thanks for sharing a copy of the magazine with one of us. Wow...I love those quilts. They feel so fresh. Great pattern and beautiful quilts! The quilting looks intensive, but it is gorgeous! I love everything about these quilts! What a fun pattern to show off large-scale prints, too! 1/4 inch quilting! You've got more patience than I! Beautiful, though :) Thanks for the giveaway! I adore your quilts and the quitting is perfect. Thanks for such a great show and tell and giveaway! Love those wedges! This book is awesome! It must feel good to see something you've designed and produced hanging at Market; receiving so much praise. You are good at what you do, lady. Keep it up! Love your work. Thanks for the chance to win a copy of Quilt Trends. Would really like a copy of the new book. The modern quilts (with their unique quilting) are really appealing to me. I rarely if ever use solid fabrics so this is really outside my box! These quilts are so much fun; I love the quilting. Thanx for the chance. I am curious as to which one comes home....the orange or green. For years, the lime green was my favorite add to all quilts and now I think it is orange. They are both gorgeous and I would love a copy of the pattern. Love both colourways of the quilt. What a fantastic pattern. Would love the chance to win the magazine. Love the wedges! It is really a different look in that scale! Thanks for offering to share the extra copy! "Intense" isn't the word that sprang to mind when I saw that quilting. But it's amazing and definitely makes the quilt. Thanks for the giveaway! Love the pattern and love the fabric! Thanks for the opportnity to win. What a super quilt! I love the modern wedges and your quilting is wonderful! Thanks for a chance to win! Beautiful quilt made with beautiful fabrics. Super cool pattern! just when i think i know what i'm going to do for a friends baby quilt i see yet more inspiration. what a terrific design Jacquie. Would love a copy, I really like the colors in both those quilts...hard to pick a favorite! Love the quilt! You are too creative! I love being inspired by your blog - your wedge quilts are no different. Awesome! Love this quilt! That bias print is pretty cool too. Love the Bouncing Wedges! What fun! Thanks for the give away. I'd love it! Thanks. Very nice quilt! It sounds like a fun magazine. ooh yes please! love that green/blue colourway and you are soo right about the solids. The design is gorgeous and the quilting really does add so much to the quilt. They both look great. I am coming around to white in quilts now.. I am not sure that I will be able to locate the magazine in my newsagents here in Australia but I'll try..
1/4 inch straight lines! Now that's a labor of love! The quilts are such fun! I could see a version of backgammon played on them. Thanks for the giveaway. Those quilts are ADORABLE. Want. Love this quilt, bought your book and love it too! I like this one too! I really like the off center piecing of white and color (wedges) ... oh and a perfect name, bouncing wedges. I consulted your book today re squaring and binding. Finished my quilt. I'm going to get lots of use from your book! Love the quilts, would be a fun new project to try. One of my favorite quilts of yours for sure! I love the pattern and fabric choices. your quilts are stunning; the quilting's beyond fantastic; my friend was at this Quilt Market & she can't stop raving about you!! Very fun pattern, and I like the fabric too. 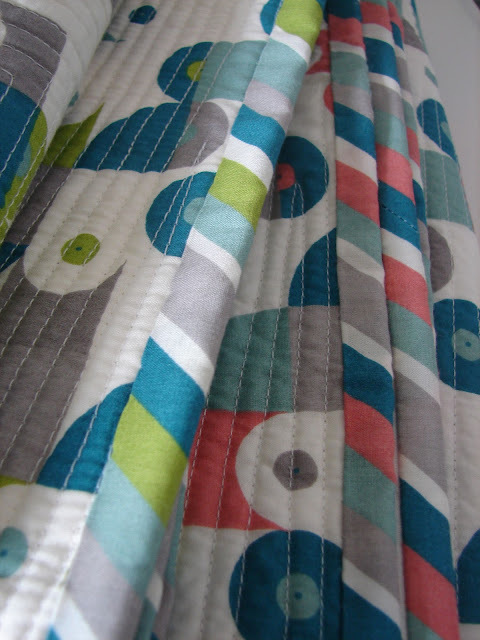 Do you do your quilting on a sewing machine or longarm? It is so nice! These quilts are awesome! I would gladly take your extra copy of Quilt Trends. :) Thanks for some more great inspiration and a chance at your giveaway. I would love to win your extra copy - thank you!! As always, your quilts are fresh, original and inspiring! And, that fabric is to die for. Is it out for purchase yet? That is definitely going on my wish list. Oh this one is really great too! :) And in case you might want to know -- I just blogged about your presentation at CMQG today! It's a bit late, but better than never! Love the bold design of the wedge quilts! You are amazing! What a fun quilt and a great way to show off large prints! Thanks for the chance to win! I love the wedges! Thanks for the giveaway. As usual, another great quilt design. Very inspirational. I just quilted concentric circles on a baby quilt. The circles were about 1/2" apart, so I hear your pain. I think it took me 7 hours to do a baby quilt! Oh, oh, oh, I would SO make this quilt!!! Thanks for the chance! Beautiful quilt! Thank you for the chance to win! I'm thinking this would be a good book to have! Thanks for the giveaway. Love the wedges and the balance of solids and prints! That is a really great graphic quilt design. Thanks for the giveaway chance. 1/4" straight line quilting, but wow that would take forever. Thanks for the giveaway.